For 12 years, Spaceflight Now has been providing unrivaled coverage of U.S. space launches. Comprehensive reports and voluminous amounts of video are available in our archives. A Russian telecommunications satellite loaded aboard a Proton rocket, flying under the commercial marketing auspicies of International Launch Services, blasted off on schedule Saturday from the Baikonur Cosmodrome. Launch of the Yamal 402 spacecraft occurred at the precise moment of 1313:43 GMT (8:13:43 a.m. EST) atop the Proton M/Breeze M vehicle combination en route to geosynchronous transfer orbit. The launch came just after sunset in temperatures just above the freezing mark, but the rocket rapidly disappeared into a low cloud deck within a few seconds of flight. It will take 9 hours and 15 minutes to reach the ascent's completion, releasing the 9,839-pound satellite into an highly elliptical orbit ranging from 4,642 miles at perigee to 22,181 miles at apogee and inclined 9 degrees to the equator. Getting there began with the six main engines of the 191-foot-tall rocket blasting at liftoff to send the four-stage vehicle in the skies of Kazakhstan. The lower three stages that comprised the Proton core vehicle sequentially fired through the initial 10 minutes of flight, leaving the Breeze M upper stage to step through four burns over the next several hours to achieve a preliminary parking orbit before heading into intermediate orbits to hit the geosynchronous transfer orbit. Deploy is expected at 2228 GMT (5:28 p.m. EST). Yamal 402 will maneuver itself into geostationary orbit 22,300 miles up where it can match Earth's rotation and appear parked over the equator at 55 degrees East longitude to begin a 15-year service life. Built by Thales Alenia Space using the Spacebus 4000C3 platform, the satellite is equipped with a payload of 46 Ku-band transponders supporting four fixed transmission beams and one steerable beam. Gazprom Space Systems of Moscow will operate Yamal 402 in expanding its orbital fleet, using the satellite to relay communications across Russia, the Commonwealth of Independent States, Europe, the Middle East and Africa. This will be the 383rd Proton rocket launch since 1965 and the 77th by International Launch Services since 1996, the 8th just this year for ILS and 11th overall by the heavy-lift booster. It is the first time ILS has launched a satellite for Gazprom Space Systems and the eighth Thales Alenia Space-built craft to ride aboard the commercial Proton. Yamal 402 was shipped from the Thales factory in Cannes on Nov. 4 to start the launch site campaign. 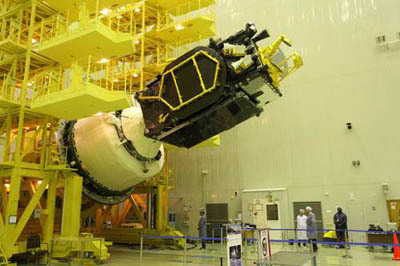 The satellite underwent final testing testing, the loading of maneuvering fuel, mating to the upper stage and encapsulation within the Proton's two-piece nose cone to form the Space Head Unit. That combined element was connected to the Proton core in horizontal fashion before rolling out to the launch pad by rail on Wednesday. The booster was erected vertically and shrouded by the pad's mobile service gantry for the final days of preparations. Saturday's flight date has held steady throughout the launch campaign. 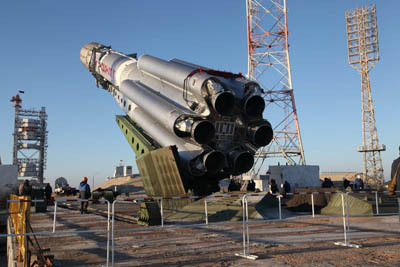 ILS will webcast the liftoff at: http://yamal402.imgondemand.com.